Where do you get the time to wander all over the County like this? Seems like you are out all night some of the time. Are you independently wealthy so you don’t have to work? Most of us have to work and have families don’t you? From your photo that appears to be closer to, next to Popeye's rather than Urban Plates. Popeyes is not on the same level as Cinnabon and Urban Plates. Sounds like you don't like restaurants patronized by people of color. If Popeyes is not on the same level as Cinnabon, why is it in the picture "adjacent to" the Cinnabon sign? Also, I looked at the online mall map and it shows it located next to Popeyes. Did they move it now? 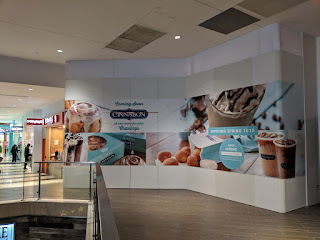 1:29: Your carpetbaggerness is showing again - if you were actually familiar with the mall, you would know that you in fact descend stairs to reach Popeyes from Cinnabon. They are not on the same level. Either delete the comment about Popeyes being on the first floor or change the image. Having both is embarrassing. Do you have any self worth at all? 11:40: I never said it was on the first floor. I sensibly stated Cinnabon was next to Urban Plates, as both businesses share the same floor level. Popeyes is down a flight of stairs. You're the nutjob who began a discussion about how I should have referenced a business down a flight of stairs instead of the one next to it on the same floor level. Punch yourself! Nobody even thinks about those three steps when they're deciding where they want to eat at the Montgomery Mall Food Court. You are literally making a mountain out of a molehill, as usual. Cinnabon Popeyes Macdonald’s. Do you ever eat any foods for grownups? Food that isn’t disgustingly loaded with fat and sugar. Maybe you should have your A1C and cholesterol checked. 4:23: LOL, if you were to look at the nutrition facts for the hipster food you're eating at expensive restaurants, you'd find it make fast food look like health food. carpetbaggerness hipster punch yourself saying three steps is s ‘new level’ re writing posts when you are proved wrong and let us not forget MORIBUND. I’m almost embarrassed for you. Dude do you even have a job? Can you even hold a job? Did your so called elite high school teach you anything at all? You clearly don't have a job, and did not attend an elite high school. Thus began your resentment of those who did. David Blair, the Washington Post, Jeff Bezos and the Sage Policy Group are among the elites who agree with me that MoCo under your beloved Council is M o r i b u n d.
Just look at the nutrition facts for your favorite "grown-up" sit-down restaurant. Thousands of milligrams of sodium alone could kill you in those meals. Vs. under 1000 mg for a Big Mac or McDouble. What sit down restaurants? Cite your sources. And did it ever occur to you that most people know how to use a stove and can cook for themselves? "Under 1000 mg sodium for a Big Mac"
950 mg, to be exact. That's a terrible amount. And that's just for the sandwich - it doesn't include fries, other sides, let alone additional sandwiches which many McDonald's customers eat with a typical meal there. 9:01: LOL - and you might have 2000-3000 mg of sodium in just your main dish at a more expensive sit-down restaurant, minus side dishes and appetizers. Now THAT is a "terrible amount." Neither one is good or evil, but makes it folly to criticize fast food over any other type of restaurant unless you are going to Beefsteak or True Food Kitchen, a health food restaurant. Enough with the restaurants already! Not everyone has to get all their meals from the drive thru. You also are obsessively focusing on fast food vs. “expensive’ sit down places. There is a middle ground. However your spectrum won’t let you listen to what anyone else has to say. Just because I say many fast food places are gross doesn’t mean I am comparing them to ‘beef steak’. I’ve already told you that several times. You just repeating the same drone over and over. You still haven’t cited your sources. WHAT restaurants have what sodium levels. Now you will respond by telling me to punch myself or call me school yard bully names. 8:21: Basically any mainstream, sit-down dining restaurant from Olive Garden/Applebee's/Cheesecake Factory, etc. to independently-owned. Have you ever looked at the nutrition facts for just about any commercial restaurant? Good luck finding many dishes under 2000 mg sodium at Cheesecake Factory, for example. Whoever said "everyone has to get all their meals from the drive-thru?" You're the one who lashed out at me, and who apparently believes I only eat fast food seven days a week. All I've said is that hipsters dismissing fast food are often killing themselves even more than the folks dining at McDonald's are, with their 2000 calorie "healthy" salads and 3000 mg sodium "healthy" chicken with vegetables dish.